WHo kILLED tHE pINK pAnTHERs ? Welcome! 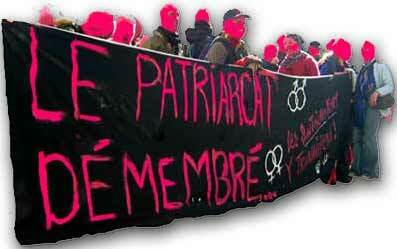 Not to the Pink Panthers ' site, but to Montréal's chapter of the worldwide Queer Rebellion. Whether you're in San Francisco, Barcelona, Paris or Montréal, the project is basically the same for radical queers-- throw the captain overboard! Heading for the shopping mall, or the salon? The Pink Panthers and, as time progresses, many others, have decided to march in the opposite direction from the thousands of gays and lesbians who are apathetically following the leaders. The Pink Panthers have decided to not obey. Disobey pink capitalism. Hetero-society. Binary gender rules. To disobey all laws that are enemies to liberty and equality. To disobey the enemies of a green earth, and to defy borders and sexual frontiers. ADOPT A PANTHER ! You heard right, the collective is finally providing all charitable souls with the privelege of sponsoring a Panther, for a donation of your choice! Impress your friends! The sponsorship contract contains absolutely no hidden obligations (no boring treks through the Granby Zoo, no boxes of Corn Pops to buy... really, no obligation!) But your grateful Panther will take it upon hirself to send at least one (1) birthday card to the new daddy and/or mama. And s/he promises, of course, to use the money exclusively to sabatoge heterosexism, and the rest of the world's alienations. so let us take it off your hands.